Dies, dies, dies...I can't get enough of them...sigh. They are uber versatile and I love how uniform the die cut is. So to further my love of dies, I have spent a "fair" (wink wink) amount of time perusing pinterest and stalking blogs for unique and interesting ways of using dies. 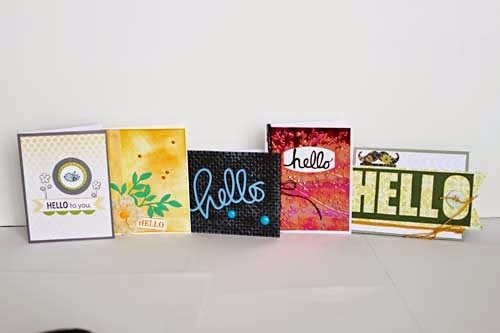 Below is my take on cards I found on pinterest...and as it happens I made several of these for the card swap but in the end, they didn't make the cut! 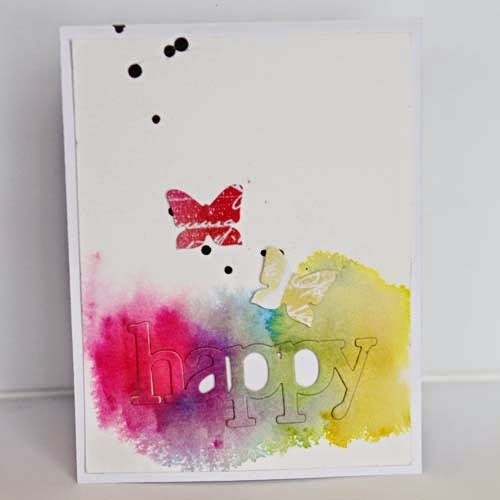 This card was made using distress inks painted onto water colour paper using a water brush. I actually love the perfectly imperfect look. After I applied the inks, I let it air dry and then spritzed it with some Ranger Perfect Pearls for some shine. You can't see the shimmer in this image...sorry but there is just a little something extra on it. When the water colours were completely dried, I die cut the "happy" sentiment. For this card, I wanted the "happy" sentiment to be slightly elevated so I cut another 4-5 sentiments and glued them together. Then I inserted the sentiment into the die cut watercolour paper, matching up the colours. Also I flicked on some Prima charcoal mist. I remembered watching a Ranger video where the artist mentioned black makes colour pop so that is what I did. Unfortunately the black Prima mist smudged and hence did not make the card swap cut. I'm not sure why the mist smudged because I let it air dry overnight but it was a bit disappointing to me as was the leaking nozzle. The "happy" die is from Wplus9. This die gets alot of mileage as I pair it with sentiments such as birthday, anniversary and so on. 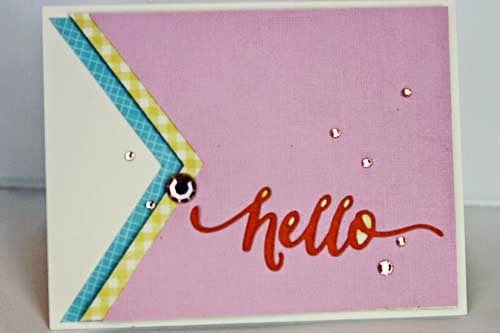 Thanks for dropping by - I am going to showcasing the stunning cards from the card swap! Thinking of a Card Swap???? Have you ever joined a card swap??? If not, please give it some consideration. It is an excellent opportunity to join the very friendly online community of Scrap Shotz. You also receive stunningly beautiful cards, maybe ones that you would not normally make for yourself and best of all, it inspires you to try new products and techniques.